In honor of Mexican Independence Day #SundaySupper is cooking a Mexican Fiesta! I absolutely LOVE Mexican Food. I immediately thought of Horchata. I love mine ice cold, on crushed ice. So what could be better then ice cold Hotchata…Ice Cream Hortchata! And of course you have to have a churro with Horchata but I wanted something a little different. I also am a brownie lover, a nice scoop of Ice Cream on top of a warm brownie is heavenly. So…brownie churros, brilliant am I right?! I mean I don’t want to brag but tooting my horn here…TOOT TOOT! I went to look up a recipe for them and there were none! They were only a dessert at a restaurant from what I could find. So that made it even more exciting…how exactly should I make these brownies? 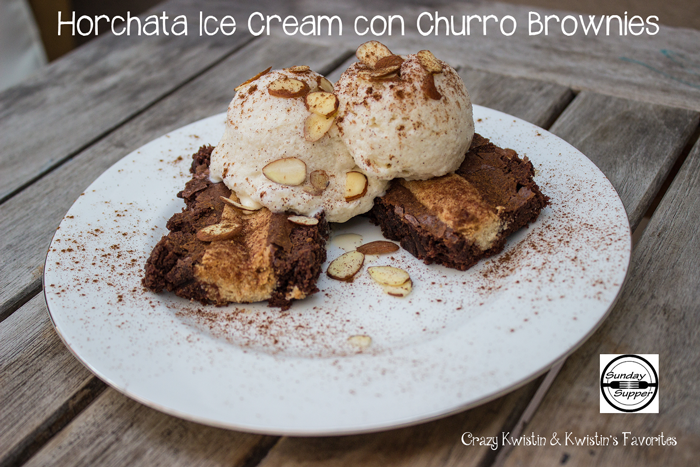 My hubby helped out with this one…we talked it over and came up with a plan, we’d make churro mix and swirl it through the brownie mix sounds easy enough. While we were shopping we saw snickerdoodle cookie mix. That’s basically what a churro is, sugar cookies, perfect! So we made the brownie mix and the cookie mix. Then rolled up the cookie dough and placed them into the brownies and topped them with a little cinnamon. Here is my instagram of the brownies. They smelled so good!! I found the recipe for the Horchata Ice Cream on Tastebook. We didn’t make the horchata fresh, since it was like a four day process and required things like cheese clothes and such… We got regular Horchata from the grocery store in the refrigerated section, usually near the OJ. We simmered it down a little since the recipe called for a concentrated Horchata. The Ice Cream was so much easier then I thought it would be! Click on link above to follow recipe for Ice Cream. It was actually really easy! The finished product was absolutely amazing! We topped it with sliced almonds and some cinnamon. The Horchata Ice Cream and the Brownies together was the perfect combination, I gobbled mine up so fast. It will definitely be a new family recipe! Crazy Kid loves the ice cream maker, rolling the dough and of course eating the tastiness. Join us around the family table this week for our #SundaySupper Mexican Fiesta – this is a party that you won’t want to miss. We hope to inspire you with these mouthwatering recipes from our talented contributors. We will be sharing them all day long and would love for you to share your favorite Mexican and Mexican-inspired recipes during our #SundaySupper live chat at 7pm (Eastern). Please be sure you join us on Twitter throughout the day (this coming Sunday, September 16) during #SundaySupper. We’ll be meeting up at 7:00 pm (Eastern) for our weekly #SundaySupper live chat where we’ll talk about our favorite recipes for a Mexican Fiesta! All you have to do is follow the #SundaySupper hashtag, or you can follow us through TweetChat! We’d also love to feature your Mexican Fiesta recipes on our#SundaySupper Pinterest board and share them with all of our followers! This looks FAB! I love the touch of nuts on top 🙂 Made my Sunday. When you have the time, please drop by my space. I just made a soup that looks like a cappuccino. Confused? Come see 🙂 I’d love to hear what you think. 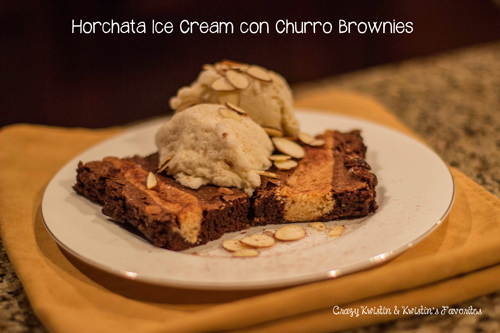 Love the churro idea in a brownie! Great flavors with the ice cream. Happy Sunday! Sounds like a yummy dessert! Thanks for sharing it! Very clever idea of putting churro batter in brownies. I think I might use the recipe I made last week and add it to a brownie mixture. Wow!!!! Now that is what I call an awesome Mexican dessert! This looks so, so good!!! What a fabulous unique dessert. It is not easy to come up with a Mexican dessert but this one looks like a real winnner!! I was fine looking at all the desserts until now. I so want this! It looks delicioso! 😉 It really was good!! I highly recommend it! I have been drinking iced horchata too like crazy. I am so addicted right now. I think today’s post is my favorite ever 🙂 and amazing job on making the brownies! I can’t wait to try them out! I have never tried horchata before – love that you made it into an ice cream! WOW what a combo – looks amazing! I’m a huge brownie lover so these are right up my alley. I bet they taste amazing. First of all, the churro brownies on their own sound ridiculously good…but the addition of the ice cream totally takes them to the next level! I’ve never tried horchata, but I really think I’d love it! Seriously, I can almost smell them through the screen. I need both of these in my life, like, immediately. Fantastic – I’m SO making both. Soon. Thank you 🙂 I love Mexican Food, thanks for hosting an awesome week!! Oh wow-these look amazing with the ice cream! WHAT!! These look beyond amazing. I have to try it now! I can have churro brownies and ice cream for breakfast right?? hehe I did 😉 the ice cream is so heavenly, I think I want to make a protein horchata shake now, I could drink it all day! 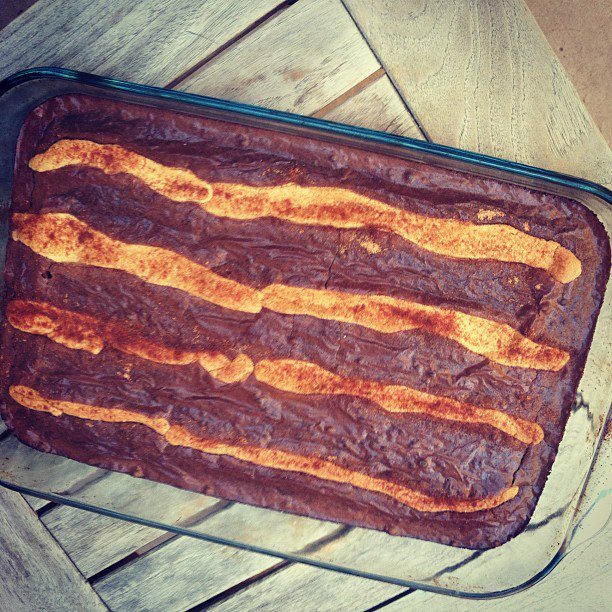 Churro Brownies sounds like a match made in heaven! Brilliant idea! Nice, simple idea for adding a Mexican flair to brownies! Sounds like a genius combination. Two of my favorite Mexican treats are horchata and churros. I can only imagine how awsome it would be to have both at the same time! I’ve never heard of horchata ice cream. I’ll have to look for horchata next time I’m at the store! Love the brownies!